One of my first friends in Kansas City was Megan. Like me, she was an old soul in a young body. We met while working on our Masters degrees at the University of Missouri-Kansas City. We also had a lot of fun exploring the city – dinners, plays, and concerts. Megan is so talented and has taught me so many things. I also owe the start of my nonprofit career to this lady. She helped me make a resume that visually popped. Her networking skills also helped me find my first nonprofit job as a grant writer. That job was one of the best teams I’ve ever worked on and a few of those fantastic women are still dear friends. Megan is Martha Stewart. Not only is she an amazing cook but she and her husband are also master gardeners. They have turned their passion for gardening into a full-scale Kansas agri-business. If you are close, visit their Next to Nature booth on a Saturday morning at the Bonner Springs Farmers Market. They have everything from fresh seasonal produce to products made from honey. I love watching their business adventures on Facebook. I was lucky enough to be a bridesmaid for Megan and Chad’s wedding. Like all weddings, they had a hiccup right before their big day. Less than a week before their big day, the building where they were going to have their wedding reception was hit by a car. The good news is that structural engineers determined it was still safe to remain open. Their wedding end up going off without a hitch. And nine years later, they are still happily married. For our wedding, Megan shared this recipe. I wasn’t sure what to think at first. Orange and chocolate chips? Sure, I’ve seen chocolate covered orange slices but I’ve never eaten them. But I trusted Megan. She’s Martha Stewart, right. 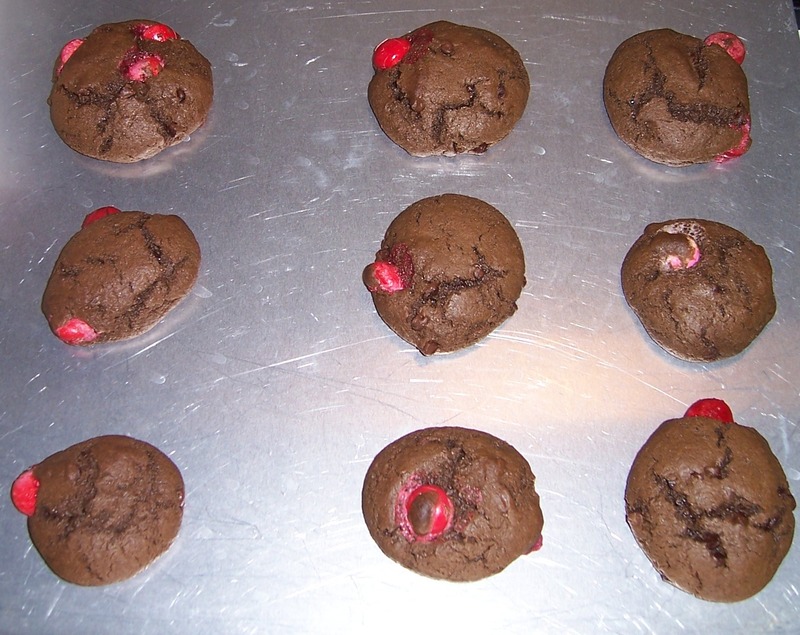 I have to tell you, these cookies were so good I wish I had made a larger batch. I hope you love these super soft cookies as much as I did. Cream together shortening, sugar, and cream cheese. Add eggs, orange peel, and vanilla. Shift together salt and flour. Then, add to mixture. Fold in chocolate chips. Drop by teaspoons onto lightly greased cookie sheet. Bake at 350 degrees for 12 minutes or until lightly golden. Cool and remove. Makes 4 dozen. I was looking for some new recipes when I ran across cookie recipe. I love Chocolate Crinkles (my signature dish) so these seemed like something I’d enjoy. Although they are tasty, I think my Chocolate Crinkles are better. But they did give me another excuse to use my Kitchen Aid mixer. Mix together butter, sugars, and eggs. Add in pudding, cocoa, flour, baking soda, and salt slowly. Stir in chocolate. Refrigerate for two hours. Roll into balls and bake at 350 degrees for 10-12 minutes. I usually work on Sundays at a hotel front desk. The nice thing about working in the hospitality industry is that some many people in the biz love to cook. That means if you can catch the TV in break room when no one is watching sports, no one complains about watching The Food Network. Since I got to lunch at 11:30ish, Brunch at Bobby’s is usually on. 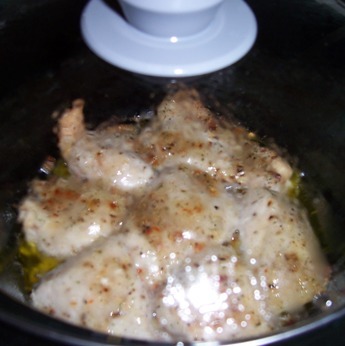 I saw this recipe and I just knew I needed to cook it up for my sweetheart – Jeremiah. This recipe is for all of you who enjoy coffee as much as we do. Spray bread pan with nonstick spray. On the stove top, melt butter in a sauce pan. Then, stir in espresso powder. Remove from heat and let it cool slightly. Using a potato masher, mash bananas in a large bowl. Add sugar, butter mixture, and eggs. Mix in flour. Fold in chocolate chips. Pour batter into bread pan. Bake at 350 degrees for 40-50 minutes. Let it cool on a wire rack for at least 30 minutes before slicing. Mix ingredients for butter. Smear on bread and serve. Since I didn’t have instant espresso powder in my pantry, I made a little coffee and added it to the batter. 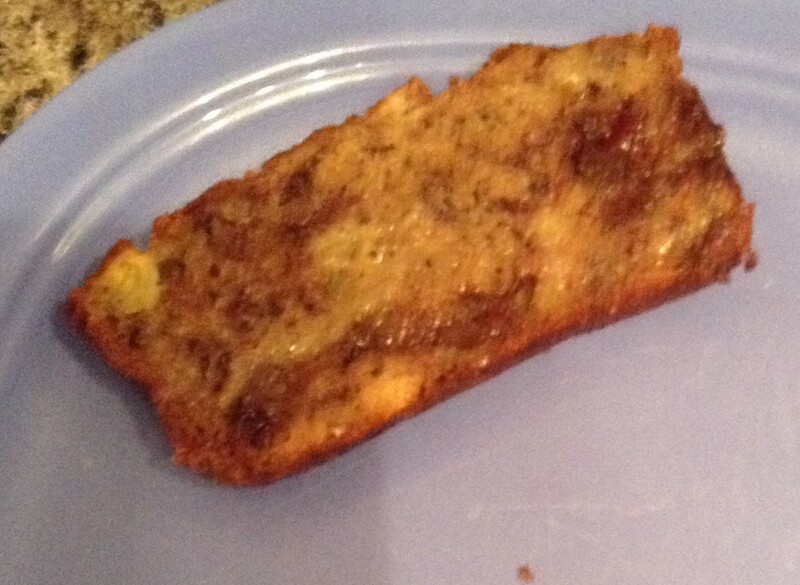 I used coffee grounds in the butter. Calling all chocoholics – this rich recipe is for you. Be sure to serve it warm with whipped topping or vanilla ice cream to help tame this chocolate dish. I could only eat piece once every couple of days. Stir together flour, baking powder, salt, 3 T. cocoa, and ¾ c. sugar. Stir in milk, butter, and vanilla. Pour into 8” baking dish. In a small bowl, mix ½ c. sugar, brown sugar, and 4 T. cocoa. Sprinkle over batter. Pour over water. Bake at 350 degrees for 40 minutes. When I was a child, my Great Grandma Kingston used to always make Rice Krispies Treats for our birthday parties. My Great Grandma Reith would make homemade ice cream. I had party cool great grandmas, right? I used to help my mom a lot in the kitchen. One treat that I always avoided helping with though was Rice Krispies bars. They were a hot gooey mess to stir and get to stick in the pan. As I got a little older, Kellogg’s started packaging and selling these treats in the grocery store. I tried making them once in college but I learned quickly it was easier to buy the pre-made ones. My rule is if someone can do it better than you for a cheap price, buy it. They are also great treats to ship to service men and women serving our country overseas. 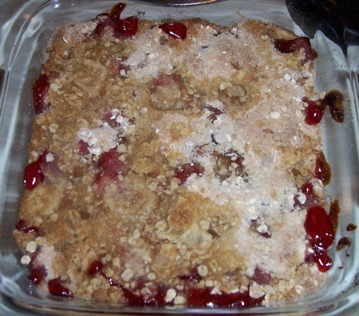 A few weeks ago, I ran across this recipe in the Hy-Vee ad for Simple Cereal Bars. 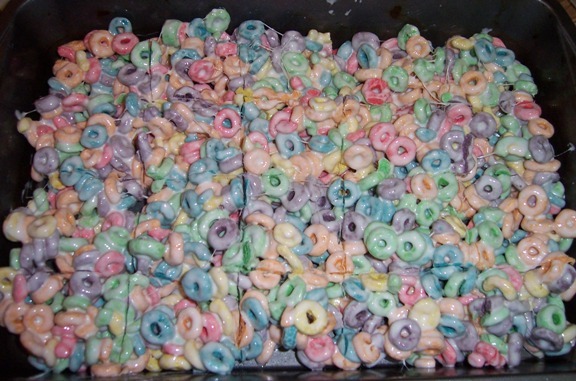 The ad featured FrootLoops, Frosted Flakes, and Apple Jacks bars. I decided if I wanted another treat flavor, I would have to give it a try. The directions suggested making it on the stovetop. My mother used to use the microwave so I thought this might be a bit easier. I selected my large oblong Rachael Ray pan. I also sprayed both the 13 x 9 pan and silicone spoon with non-stick spray. I really think both of these things helped. Recipe challenge accepted and achieved. Pick your favorite cereal and give it a try. Melt butter in a large saucepan on a low heat. Add marshmallows and stir until completely melted. Remove from heat and pour in cereal. Stir until completely melted. Press into greased 13 x 9 pan. This recipe serves 12. My mother likes to make them with Cheerios. I think Golden Grahams might also be good. Look for coupons for your favorite cereal and buy them when they are on sale (about every 6-8 weeks). This recipe takes a whole bag of miniature marshmallows and almost a whole box of cereal. As you know, I’m a big believer in always having a variety of cereals on hand and I love to save $. I put the cereal bars in the fridge to harden before cutting. Everyone has a word they don’t like. One of my exs over used the word “audacity” so I avoid using the word at all cost. Others struggle to pronounce words. My ex who was bilingual in two languages really struggled with the word “Worcestershire Sauce”. It is a kind of hard word to say if you don’t slow down. 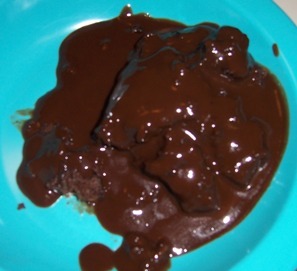 The first word that came to mind when I tasted this recipe was moist. It made me think of my friend and former co-worker Kelly. She detested the word “Moist”, perhaps even more that she hate people inappropriately using exclamation marks. (Can you tell we worked together as grant writers?) One time, a co-worker and myself called her office and said “moist” just to freak Kelly out. Of course she knew it was us by the internal caller id. But we were laughing so hard it still puts a smile on my face just thinking about it. It truly is a terrible word. When you thesaurus synonyms for moist, you get: humid, soggy, clammy, saturated, soaking, damp, wet, and tacky. Not exactly the words I was looking for to express my sentiments. Perhaps the best words for me to describe this cake are – soft, sweet, and delicious. I hope you enjoy it as much as I did. Yellow cake with sour cream chocolate frosting is my favorite birthday cake flavor. Pre-heat the oven to 350 degrees. Spray 8 inch glass baking dish with non-stick cooking spray. In large bowl, beat cake mix, water, sour cream, butter, and egg with a mixer. Stir in 1/2 c. chocolate chips. Pour in dish. Bake for 22-28 minutes. Cool completely – one hour. Then, melt 1/2 c. chocolate chips with 1/2 tsp. vegetable oil. Microwave it on high for 45 seconds, plus 15 seconds increments til completely melted. Pour into a Ziploc baggie, cut corner, and drizzle over cake. Sprinkle with remaining chocolate chips. I used half light and half fat free sour cream. Another great substitute is regular or Greek yogurt. I also used sugar free cake mix. I also think you could have used a chocolate cake for an even richer dessert. 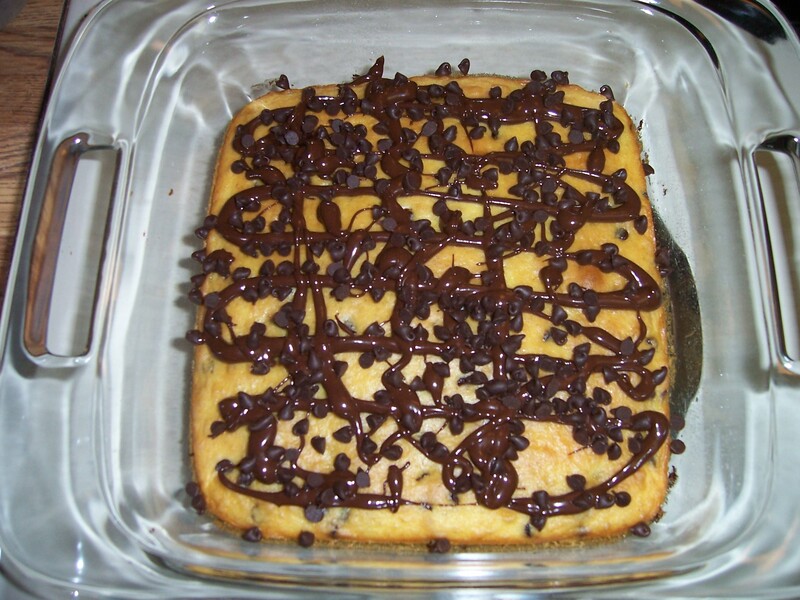 You could easily skip the extra chocolate chips on top and it would still be good.